Other than meeting inspiring people, my favourite thing about travelling is unexpectedly finding places that are eco friendly, unique or naturally beautiful. Lucky for me, Southern Thailand was filled with all of those things and I've put together some of my favourite finds from my trip. Our stay in Kamala was a result of my boyfriend working with a local villa resort. This meant we hadn’t really planned our visit as we presumed we’d be creating lots of content and lazing by the poor the entire time. However, we thought it would be wrong to leave without visiting the local town, so on our last morning, we decided to head into Kamala to explore. Although it was extremely hard to leave our stunning accomadation, when we arrived in Kamala, I was delighted to find out that it is actually known for its super clean beaches and environmental education. At the entrance to the main beach, there were several posters urging people to take their rubbish with them. 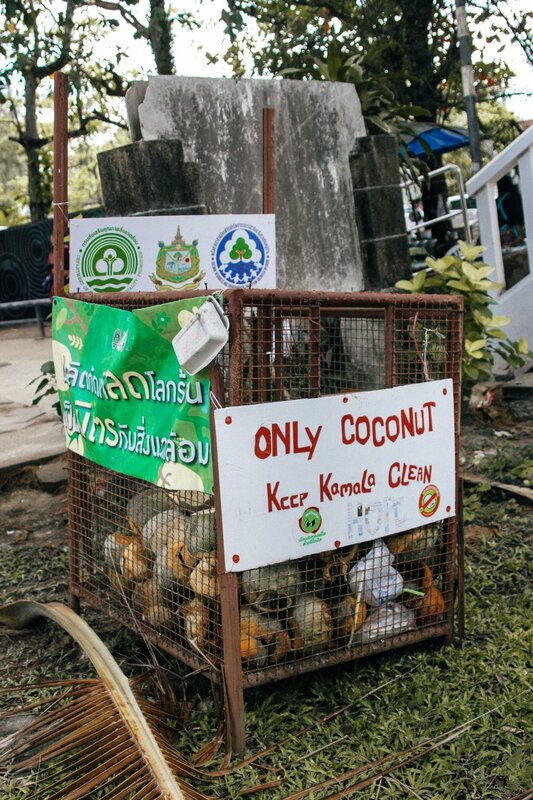 There was also a photos displayed of the local community and volunteers cleaning up rubbish and several bins dedicated to coconut waste and empty plastic bottles, bags and straws. Promthep Cape is a viewpoint located in Nai Harn Beach, Phuket, best known for it's sunset views. It is the island’s most photographed and best known locations. When we arrived, we were overwhelmed with the crowds of people, cameras and selfie sticks. However, we came to realise that even in a spot where thousands of people visit daily, you can still find a quiet spot to take a photo and enjoy the view. We headed down a long rocky path, before coming to the point of the lookout – where there were only a few other people snapping away. This ended up being one of the most incredible sunsets I have ever seen, it was such a peaceful spot and I’d definitely recommend trying to find a hidden or off the track location at popular destinations - it's totally worth it! I set out to visit Old Phuket Town after reading it was one of the must do spots in Phuket, however, I was not expecting such an adorable Portuguese-influenced town. 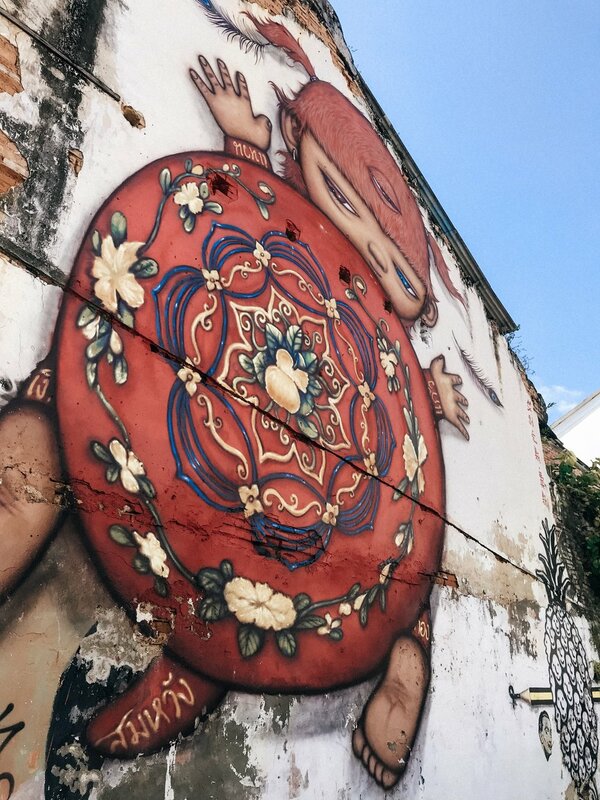 Covered with colourful street art and mosaic tiles and filled with bohemian coffee shops and locally made clothing and accessories, Old Phuket Town is a must if you’re a bit of a hipster lover, like myself! Over a week into our travels, I was craving a veggie burger and was on the hunt for a cute little café. A quick Google search lead me straight to May & Mark’s, a short walk from our hotel. May & Mark's Restaurant and Bakery is a small, inexpensive vegan/vegetarian friendly cafe (and hostel) in the heart of Krabi Town. The menu represents the taste of the travellers that have passed through and left behind their favourite recipes, including Mexican, Italian, German and of course, Thai cruise. May & Mark's is also one of the best bakeries in Southern Thailand, and the only one that makes sourdough bread - which they were taught how to bake by a New Zealand boarder! The food was that good at May & Mark's, we went back again. This time, ordering half the menu including a vegan Mexican Buddha bowl, cashew nut stir fry, potato wedges, veggie spring rolls andddddd iced mocha's (oops)! We then strolled around the Krabi Town fruit markets and it was great to see so much perfectly imperfect fruit. After learning the hard way that ferries are not an ideal form of transport for a day visit to the islands, we decided to book a number of local tours, including a visit to the Hong Islands. The Hong Islands are a small group of islands, northwest of Ao Nang in the middle of Phang Nga Bay. Unlike, the iconic Phi Phi Islands, the Koh Hong Group are far less crowed and you’re more likely to find a piece of paradise all to yourself. I had spent a little extra on this tour and booked us a kayak. As sad as it is, I originally didn’t want to be out in the water for too long as I wanted to take some photos before we had to move onto the next location. However, that changed as soon as we came across untouched coral reefs and hidden caves around the base of the limestone karsts. It was incredible to see so many fish from the top of the water and it was nice to disconnect for a while and take in the scenery around us. All photos were taken by myself, Lauren Grimshaw.